The double bass provides a unique sound in classical music. 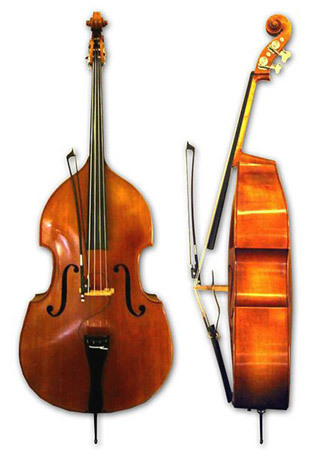 The lowest of all string instruments, the double bass (pronounced “base,” not like the fish) is enormous, bigger around than the average human being. The instrument can play much lower than anyone can sing, and it provides the foundation for the orchestra’s sound. In an orchestra, basses are almost always way over on the right side of the stage. Bassists play sitting on a very tall stool or standing up. By the way, there’s no such instrument as a single bass. The words bass and double bass mean the same thing. This is one of the most popular pieces for bass and piano — and Schubert didn’t even write it for the bass. He wrote it for an antiquated string instrument called the arpeggione, which nobody even has in the closet anymore! The double bass, granddaddy of the string section, plays the lowest notes.